Are you looking for Titanic Universe’s Souvenir Gift Shop? Titanic souvenirs are very popular among the many museums that celebrate the memory of the Titanic. Many items have been branded with the Titanic name and are available to take home as a reminder of honoring the memory of the legendary vessel. 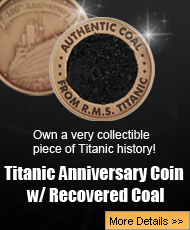 Although on a different level as Titanic artifacts and other collectible Titanic memorabilia, Titanic souvenirs can also be a great gift to enthusiasts of the event or just a reminder of the historic value of the Titanic. From copies of the construction plans to Titanic souvenirs pertaining to the James Cameron film, the number of items that have been created to celebrate the Titanic is overwhelming. Luckily for those interested in the Titanic, there are a large number of pictures with survivors, those who were lost in the tragedy, and newspapers from the time of the incident that have been made into collectible Titanic souvenirs. One of the most sought after Titanic souvenirs are the copies of newspapers from all around the globe that covered the tragic event of the Titanic sinking on her maiden voyage in 1912. Those lucky enough to find these Titanic souvenirs own a piece of maritime history with detail as clear as the day it was printed. Though the originals are nearly impossible to find, the recreations are still a great depiction and one of the Titanic souvenirs in high demand even today. Famous publications including the New York Tribune and St. Louis Post-Dispatch are just an example of newspapers that have been recreated and give riveting stories about the Titanic’s tragic demise. For those who can’t get enough of the majesty of the vessel, Titanic souvenirs are a wonderful way to remember her and her place in history. does any one know any other place i can get artifact pictures? If you google ‘Titanic artifact auction’ and go to images, you’ll get some.